My “flower arranger” and I have been away for several weeks, one with dear friends at Topsail Beach in North Carolina and one with our daughter and granddaughter in San Diego. (More about San Diego in future posts) My local granddaughter Kate came over to make sure the pots were watered. We have had a lot of rain during our absence; the turf was high and the ground soggy when I took A Walk in the Garden the first time upon my return. I was delighted to see the good condition of things and was greeted by a decent amount of color, decent for mid August in North Carolina. 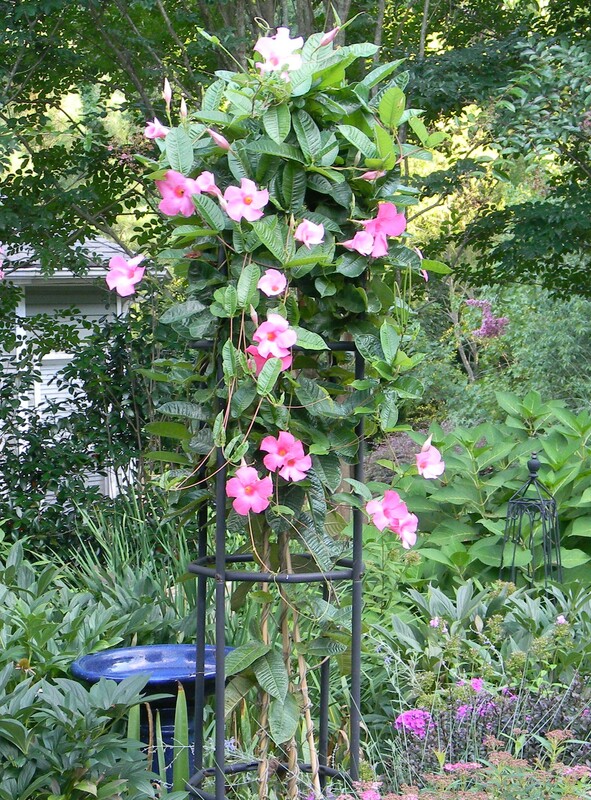 Every year I plant a mandevilla vine (an annual). I was fortunate to locate a four foot vine at the beginning of the season, so we got a head start on growth. It looked a bit dreary when we left two weeks ago, but the rain (and time) now has it bursting out with its lovely pink blossoms. Clematis ‘General Sikorski’ has just started reblooming. It was quite profuse in May; I cut it back to about three feet, continued to water it well, and here it is. It has reliably rebloomed in my garden for the past seven years. 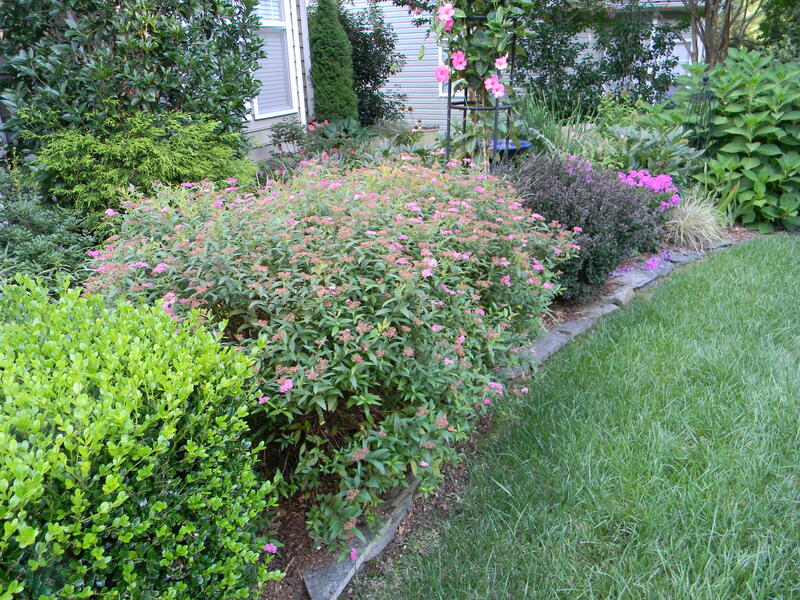 “Anthony Waterer’ spirea is one of the signature plants in my garden, with seven of them spotted around. I dead headed them after their first bloom last spring and here they are, full of blossoms right on cue. They are a much deeper pink than shows in the photograph. When they fade, I will dead head again in hopes of a late frost. In several years I got a third cycle of bloom before freezing temperatures hit. Variegated liriope plays a supporting role in my garden. I use it frequently as edging along borders. But this is the time of year when it sports its delicate pale lavender flower spikes and takes on a more visible part. You may see it some Monday in a vase. 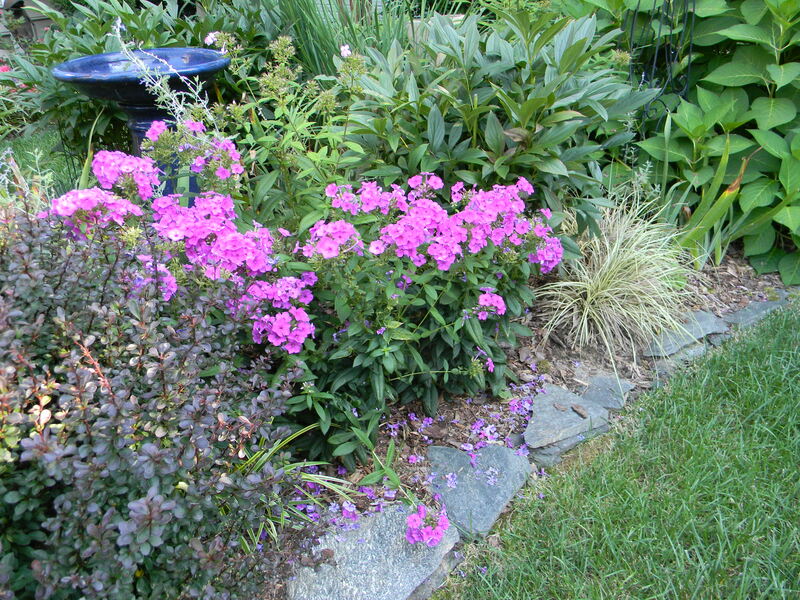 Phlox paniculata ‘Flame Lilac’ has continued to bloom since I planted six of them in early April. It came in bloom from the garden center, and I have dead headed as the flowers faded. New growth brings forth new flowers. It will be interesting to see how it withstands its first winter in its new home. I hope it will prove to be a strong performer, as this first year has brought great satisfaction. The crape myrtles are starting to slow down, but there is still lots of color from the nine in my back garden. Coneflowers and Becky daisies are going strong, and the ‘Summer Snowflake’ Viburnum plicatum var. tomentosum continues to put out new growth with accompanying white flowers. The annual vinca hasn’t missed a beat. My last remaining Knockout rose was nearly destroyed by the Japanese beetles and other predators in June. I cut it back severely, and I am happy to see that it has come back strong with substantial new growth and full of buds. The bird feeders were empty. I refilled them, but have noticed that our neighborhood birds have been slow to return. I’m confident they will be back. I suppose they have had to rely on other sources in our absence. 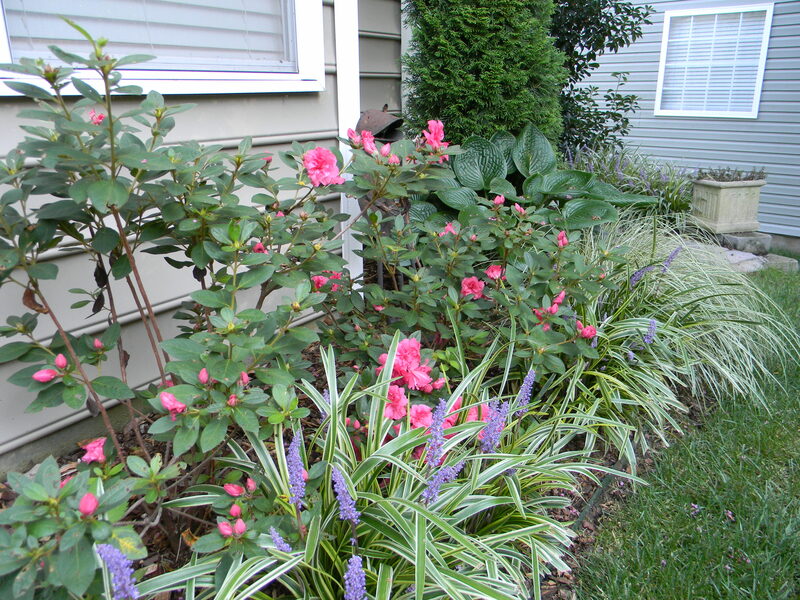 This entry was posted in Gardening and tagged Anthony Waterer, Anthony Waterer spirea, Becky daisy, bird feeders, birds, clematis General Sikorski, coneflower, Encore azalea, General Sikorski, Knockout Rose, liriope, liriope muscarii variegata, mandevilla, mandevilla vine, North Carolina, Phlox Flame Lilac, phlox paniculata, San Diego, Topsail Beach. Bookmark the permalink. You would not guess from the photos you had been away for two weeks, your garden looks lovely, especially the mandevilla vine, its not a plant I have ever grown, too tender for me, but looks spectacular. We plant a new mandevilla each year. It is not hardy in our area, so we treat it as a replaceable annual. Thanks for your kind words. Such beautiful flowers. You were helped by Mother Nature, I see, with the rain, etc. I had no diea that you could cut clematis back and get more blooms. I have one rebloomer, and two that bloom throughout the summer, but never tried cutting back the spring bloomers. I’ll try it with one or two next year. Thanks. And give me your address, so if it doesn’t work I can come and yell at you… OK, I hope you laughed at that. Thanks, Cynthia. 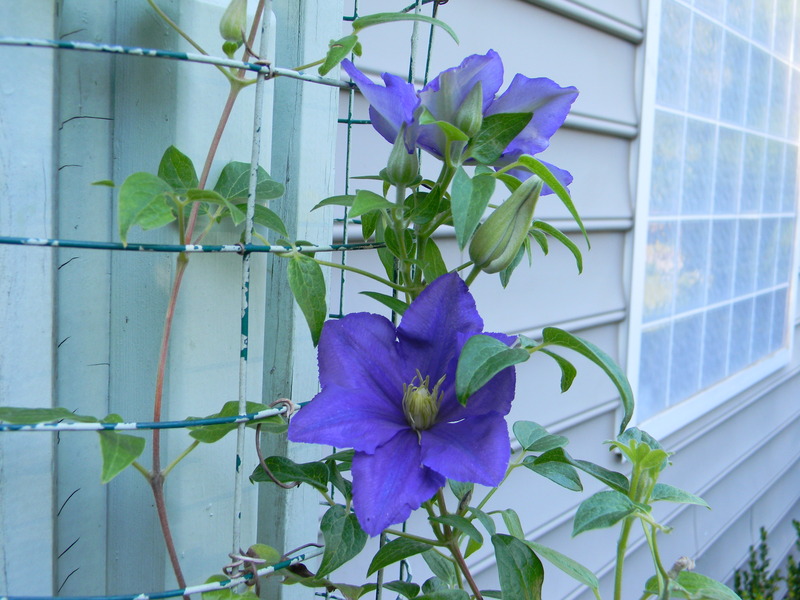 Try cutting back a clematis…just one…to see if it will come back for you. By the way, I live in South Antarctica; you are welcome to visit anytime. Your liriope look stunning – sadly I didn’t have much luck with them up to now. 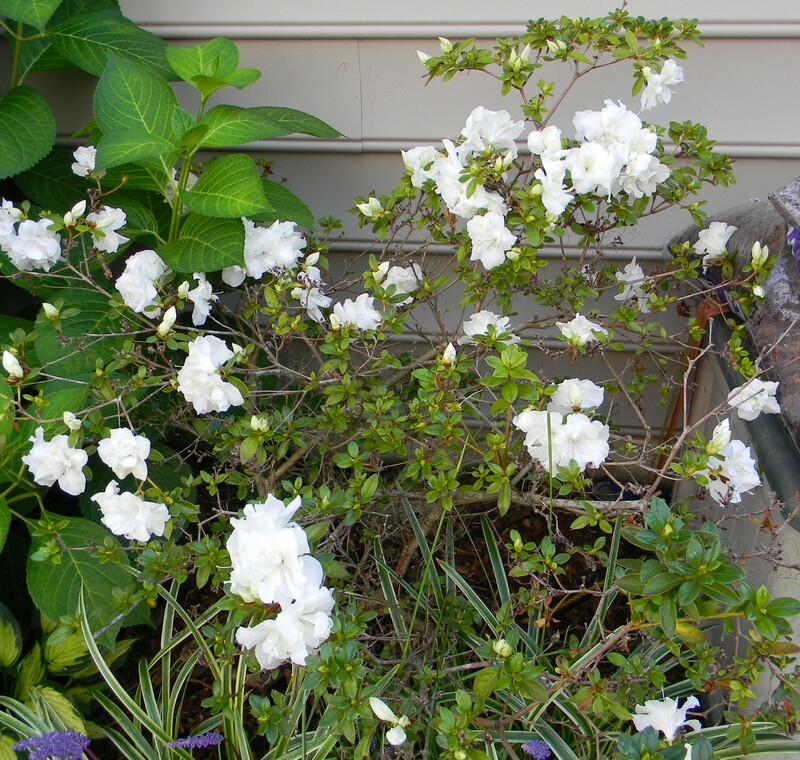 I should really try a Mandevilla, they’re divine. 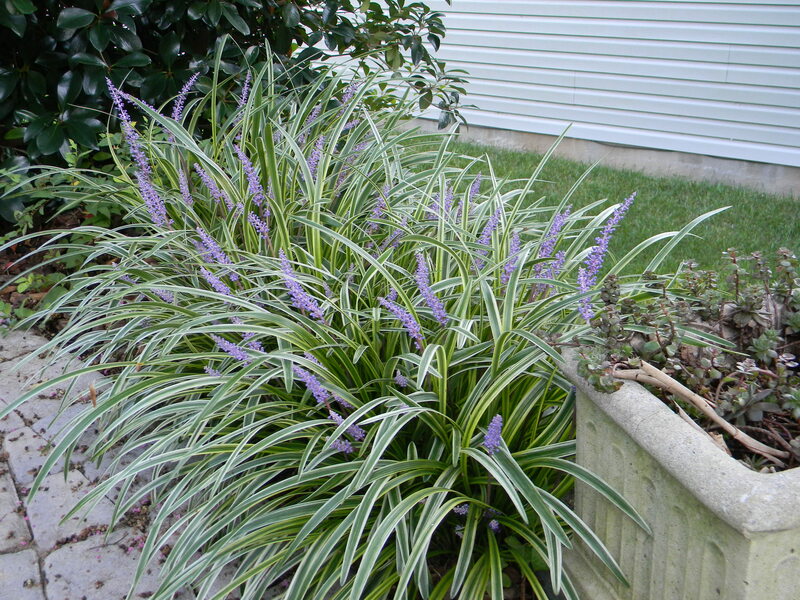 A caution: the gold variegated liriope is great, but be wary of the silver…it spreads like wildfire. Your garden looks great. Hard to believe it’s August. Your clematis reblooming tip surprised me. I’ll try it. Is it too late to try it now on a Jackmanii? I waited a bit late this year to cut back my clematis, including a Jackmanii. It hasn’t rebloomed as it has in past years, but I do see new growth. We shall see. You might want to cut back just one stem of your Jackmanii, see how it does, and then try again next year right after it finishes its first bloom. Look on it as an experiment. I only do this on clematis that bloom in spring. Thanks for you kind words.